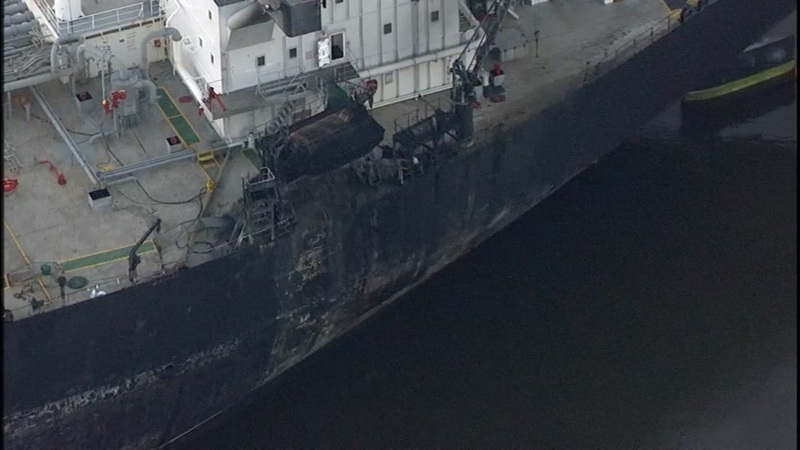 DEER PARK, TX (KTRK) -- The Houston Ship Channel is back open after a fuel leak sparked a fire Tuesday morning. The channel reopened at 3:31pm, according to the U.S. Coast Guard. Traffic was closed for a mile southwest of the Battleship Texas State Historic site, between the Cargill facility and the Cemex dock, as teams respond to leaked fuel oil from a ship Tuesday morning. Around midnight, a pilot aboard the 810-foot tanker, Aframax River, notified Coast Guard Sector Houston-Galveston watchstanders that the tanker was on fire near the Intercontinental Terminals Company. It was reported that a bunker tank was punctured and caught fire. The tanker was not carrying any product when the incident occurred. Coast Guard Station Houston and Station Galveston boat crews, two Port of Houston Authority fire boats and Harris County Sheriff's Office marine division responded. Fire boats were called to the docks of the Intercontinental Terminals Company on the Houston Ship Channel, just north of Texas Route 225 and east of the Beltway. The Houston Ship Channel was closed at 12:08am, and the Coast Guard established a safety zone from the Cargil facility to the Cemex docks. A portion of the Houston Ship Channel was shut down as a precaution to keep other ships from tracking the fuel throughout the channel. The Coast Guard says it is still trying to determine how much fuel spilled out.